BAYOG, Zamboanga del Sur, Jan. 18 (PIA) -- Mayor Leonardo L. Babasa, Jr. of the municipality of Bayog, Zamboanga del Sur, thru the Municipal Budget Office and in coordination with the barangay local government units conducted the Barangay Computer Literacy Program which started on November 28, 2011. This was held at the Office of the Municipal Budget Officer-Guest House Computer Room, Municipal Government Center here. Twenty-eight barangay treasurers attended the trainings in seven batches for ten weeks. 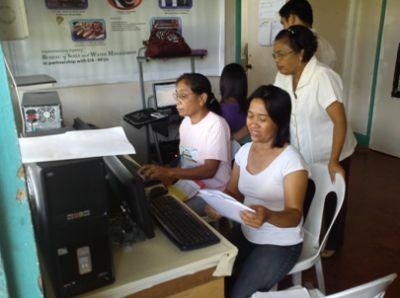 The training enabled the participants to know the importance of computer literacy, the basics of computer operation and to formulate their respective Barangay Annual Budget for 2012. Standing is Melly G. Madamba, Municipal Budget Officer as she watched Barangay treasurers doing their assignments. Melly Galambao-Madamba, together with Lorenzo Sta. Ana, Jr., technical staff, handled the said training as instructors.